Getting in just ahead of the hordes at IFA 2012, LG has taken the wraps off its latest high-end Android phone, the LG Optimus L9. It's not a quad-core behemoth as predicted by a Chinese site which claimed the 'L9' would be an LG-made processor powering a True-HD screened, 10MP camera'd mega phone. That sounds more like the beast-like LG Optimus G, unveiled yesterday. The real Optimus L9 comes with a 1GHz dual-core processor behind a 4.7-inch IPS display running Android 4.0 (Ice Cream Sandwich). LG is pushing the stylish design of the handset (although it still looks very LG to us) and its super-slender 9.1mm waistsize. Beyond the surface, you're looking at 1GB DDR2 RAM, 4GB memory, a 5MP camera and a VGA front-facing snapper for video calls and embarrassing drunken self-portraits. The whole shebang is powered by a 2150mAh SiO+ battery and a few standard extras like DLNA compatibility and LG's QTranslator translation feature round the L9 off nicely. And who's it all for? Everyone! "The Optimus L9 is a great smartphone that appeals to every consumer," said Dr. Jongseok Park, president and CEO of LG Mobile, rather optimistically. You're probably wondering when you can get your hands on the L9, seeing as how it definitely appeals to you - no exact word on that yet, but we'd expect it to hit the UK and US at some point in September with a fairly premium price tag in tow. 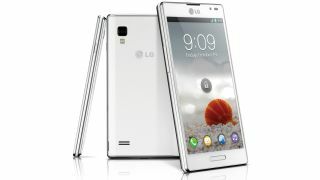 We'll be sniffing the handset out at IFA 2012 so stay tuned for our hands on LG Optimus L9 review.